Phil shared this in our private Facebook mastermind group the other day. I LOVE waking up to this kind of stuff in the morning (NOTE: see image above). It’s like pounding 10 cups of coffee and running 6 miles before 8 am. And most importantly, they’re not afraid to fail and learn from their mistakes. That’s the type of person I enjoy working with. 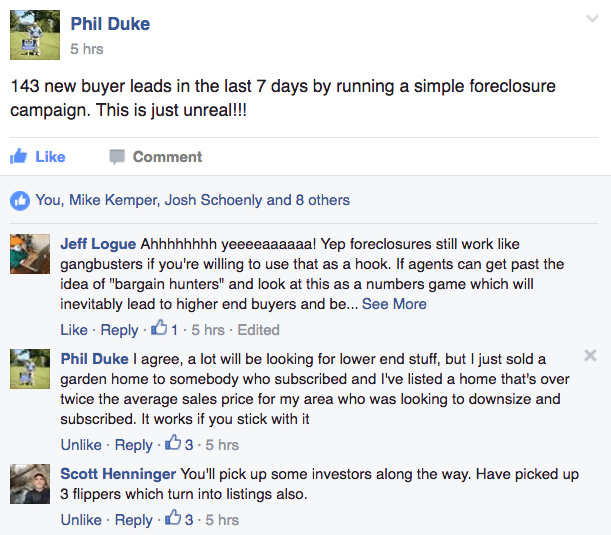 Take Phil for example, who’s been a faithful client for a while, but he’s just now discovering the power of foreclosure leads for the very first time. We’ve been harping on this concept since 2008, but the problem is not all agents are ready to receive the message. The 3 points that I just shared above are valid concerns. I get it. 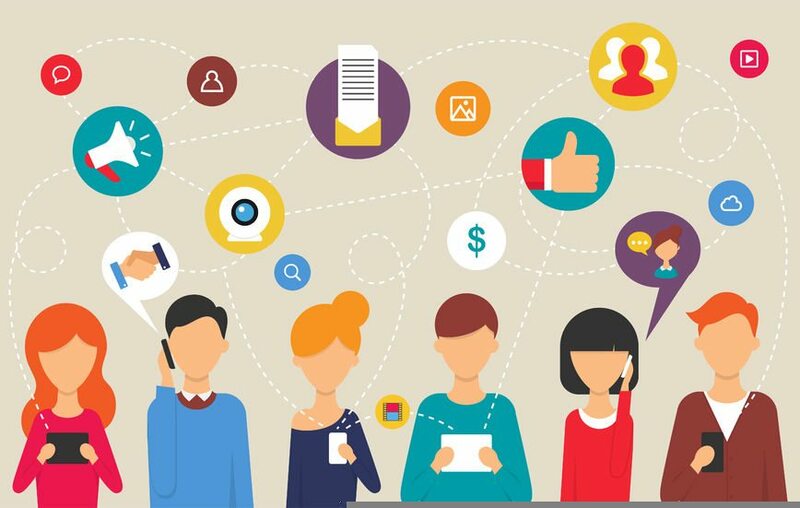 But time and time again, what we have found is that this little game of lead generation is all about numbers. Just like prospecting, you’re not going to land every opportunity, so you need quantity to get to the quality you’re looking for. Let’s say you had $100 to spend on Facebook ads. With that budget you had a choice between targeting ONLY luxury buyers or the “bank owned properties” crowd. Now, let’s consider a healthy (and frankly generous) average of $1.50 for each luxury lead you produced. Your outcome would be about 67 leads. Not too shabby. Especially when considering the fact that these people may purchase a home for $500K or more dependent on your market. 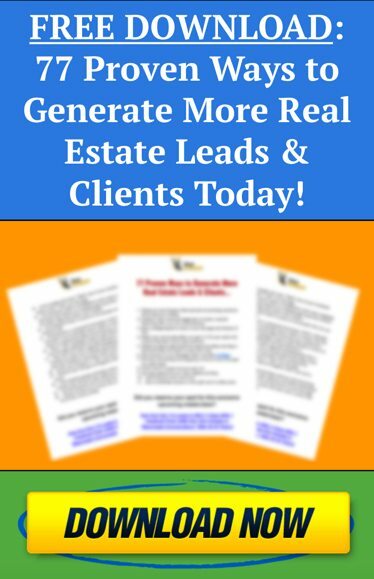 On the other hand, you could go with foreclosures and start pulling leads in at a good average cost of $.80 per lead, which would land you 125 new emails in your database. As a result, you have nearly doubled your total leads simply by going with the bank owned niche off the bat. Now, it could be argued that the luxury leads are twice (or whatever number you want to assign) as valuable. First, it’s really difficult to know exactly what the lifetime value is for each type of lead you’re generating unless you are seriously tracking your data. During the time that you would spend trying to figure out #1, you could be pumping out double or triple the amount of leads every single month. We have heard so many of our clients share how those who started out as bargain hunters on their list ended up buying much higher value properties in the end anyways. Remember, these are human beings that are signing up for your offers. 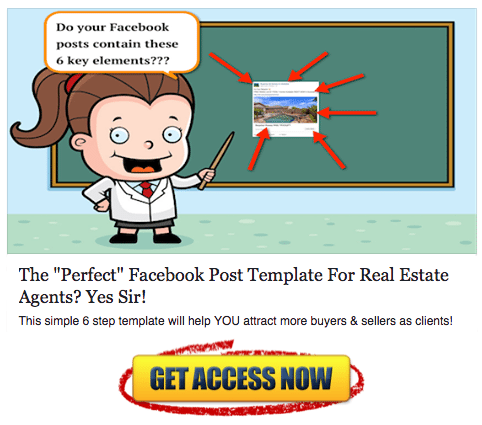 If you set some simple targeting within Facebook, you can be sure to attract buyers who are much more likely to purchase homes in more desirable areas. Foreclosure offers naturally produce MASSIVE virality. It is one of the sexiest hooks out there, hands down. You will have to work far less to get the social media exposure you desire. People love a good deal and are much more likely to like, comment, and share this information with others. Going back to #4, if you learn how to follow up with your email list the right way, you can ethically guide your leads down a path that will increase the likelihood that they will purchase higher end homes anyways. 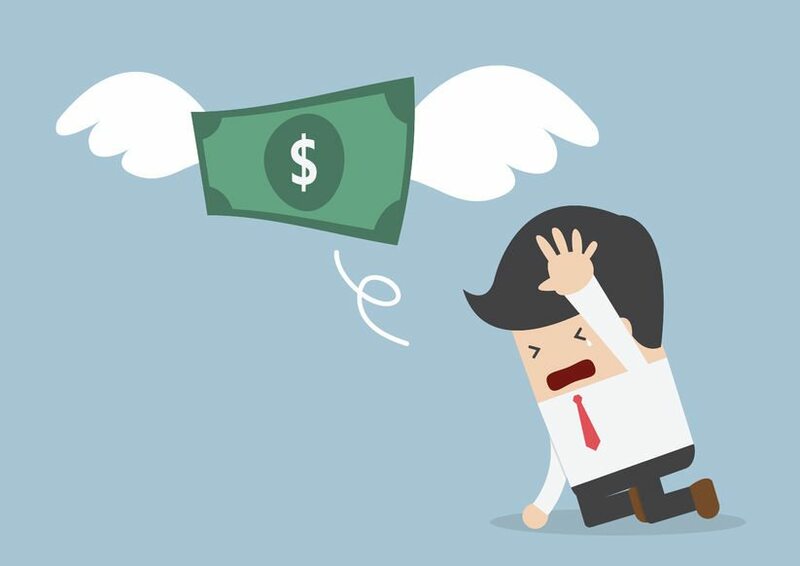 Sure, there may occasionally be deals that your buyers shouldn’t pass up, but many times it will be in your clients’ best interest to not buy a foreclosure property. A majority of your leads will not be ready to purchase for at least 6 months or more. And A LOT can change during that time. Although they may enter your world as a “foreclosure lead,” there’s a really good chance they may get married, start a family, get a raise, change their mind, etc. Instead of Either/or, How Can You Do Both? For the next 30 days, designate just 1/3 of your Facebook marketing budget for bank owned leads. In the meantime, you can continue to run your other offers without sacrificing any results, while also testing out this new concept. Just see what type of activity it may produce for you, and you may be shocked. And worst case scenario if things don’t work out the way you want them to, you can simply go back to what you were doing before. But I have a hunch that you may like what you see, and that 1/3 may turn into 1/2 or more by next month. And if you need any help putting together a foreclosure campaign or creating the landing pages so you can start generating leads immediately, simply GO HERE to checkout all that CA PRO has to offer right now.